I try to manage a large handspun project once a year. In July 2008, I completed the handspun, hand dyed lite lopi sweater. 2009 brought me my handspun february lady sweater. Sadly, 2010 brought a couple of smaller shawl projects, and nothing at all epic. 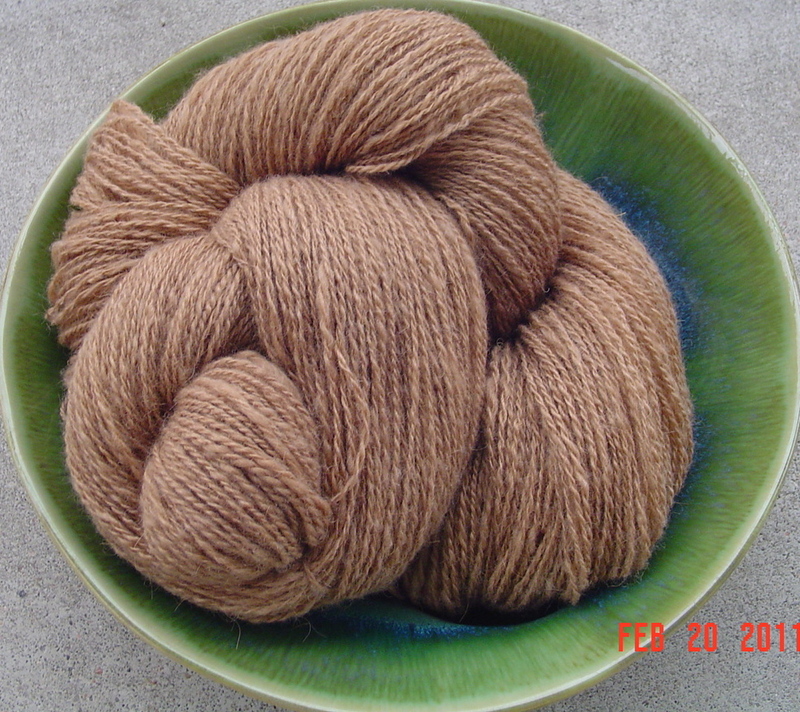 You could say that I was already preparing for my 2011 epic handspun project. Last year we attended the Iowa Sheep and Wool festival. While there, I purchased 8 oz. 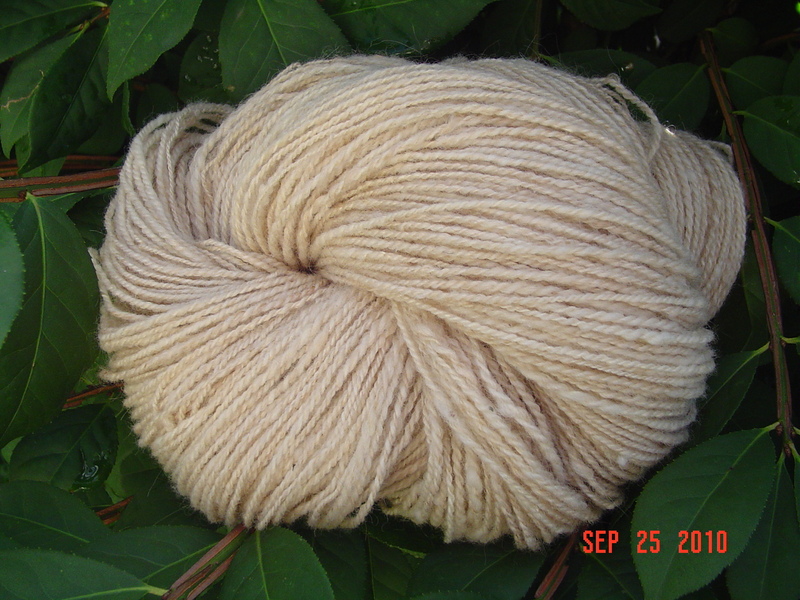 of Alpaca/Cormo/Silk and 8 oz. of camel top. I spun them 2 ply. The alpaca/cormo/silk was absolutely a bear to spin. What those pretty white balls of top held were only slightly processed blends that had a ton of vegetable matter and even entire bug carcasses. It was a slubby, dirty, awful, messy experience. But I still got good yarn. The camel was a different story. Lofty, light, perfectly clean, heavenly soft, and also gave me a ton of good yarn. 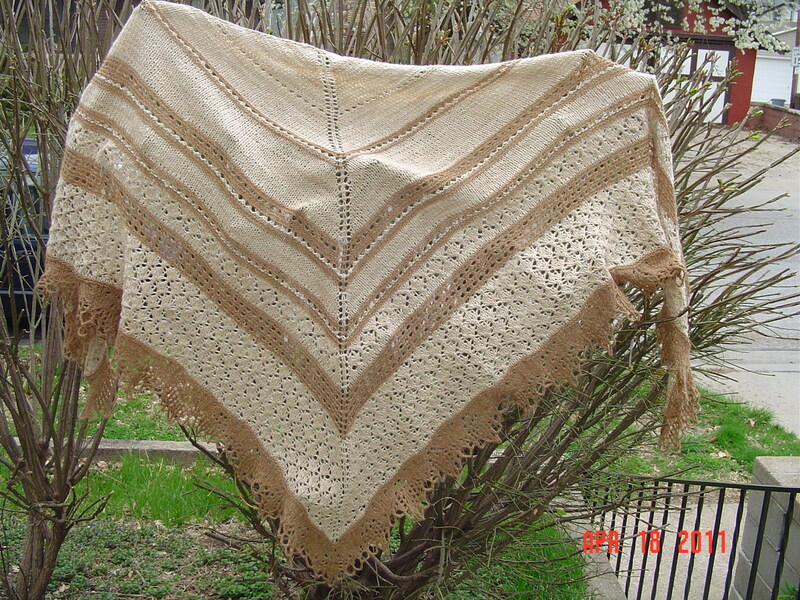 In December 2010, I began the Lilia Hyrna shawl out of “A Knitters Book of Wool.” The idea was to use the yarn undyed for this purpose. I knit on it in spare time between other projects, then at some point after Month O’Socks, I brought it to work and kept it there, working on it on my lunch break. After finishing the second chart and the set up rows for the final chart last week, I decided to bring it home over the weekend and give finishing it up a go. I worked on it Friday night. Saturday was busy and I had no time to work on it, so Sunday began a marathon of finishing. It took all day to do 6 rows and a crochet bind off. By the time I went to bed, the shawl was blocking on the floor and I knew I was going to be wearing a new shawl soon! This shawl is far larger than I anticipated it being. The crochet bind off was a new experience for me. 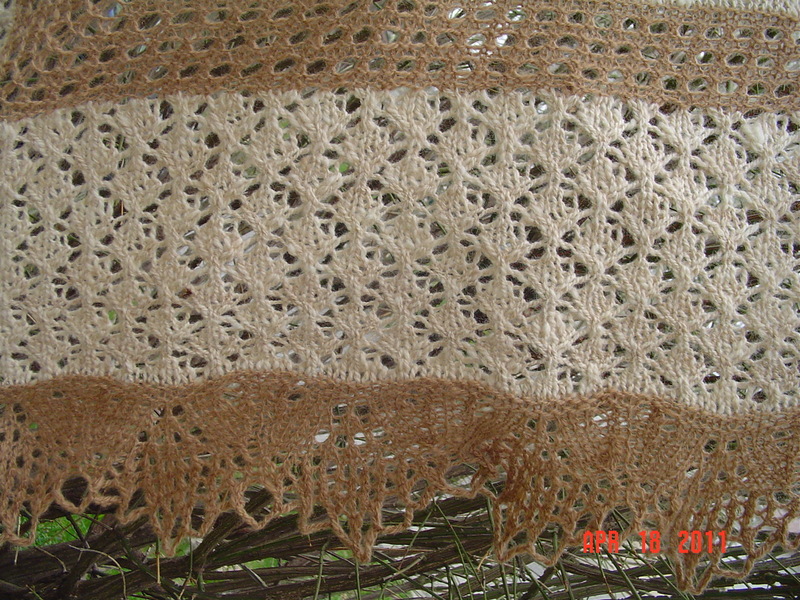 I love the natural, undyed fibers used on this shawl, it gives it a rich tone while still looking handspun and warm. I still have a ton of leftover wool, and have some dangerous projects in mind for it. But they’ll have to wait for the hottest days of summer.